"Live One on One USMLE Review Course with Extensive and Thorough feedback" "Dr. Malik teaches Medicine from fundamental aspect of things" "He is the BEST USMLE TUTOR because he works on your mind" "BEST USMLE TUTOR is truly an understatement" "Absolutely the Best "Dr. Malik is The Best Medical Teacher a Student can have!!! "Hands down Outstanding" "Amazing USMLE Tutor" "Best USMLE Tutor that You can Find" "Best USMLE tailored Review Program" "BEST USMLE Review" "Got me ready in just a few weeks" "able to pinpoint my areas of weakness and helped me through them" "Dr. Harish--you are an exceptional teacher and person" Dr. Harish you are a brilliant teacher, I remember smiling during the test because this time I knew the answers to the questions! Please leave Student Reviews in the Comment Section Below. Please Call/WhatsApp/Message BEST USMLE TUTOR at +1 803-493-5573 to learn more about Best One-on-One USMLE Tutoring Sessions that are Revolutionizing USMLE Preparation Globally or Please leave us a messge including your Name, Phone Number, Previous USMLE/COMLEX/SHELF EXAM/MEDICAL SCHOOL SUBJECT EXAM Scores and Deadlines to work with and Dr. Harish Malik will Contact you to tell you the BEST POSSIBLE HELP that WE CAN OFFER FOR YOU. JOIN BEST USMLE TUTOR's LIVE INTERACTIVE ONLINE ONE-ONE-ONE ADAPTIVE PERSONAL USMLE STEP 1, STEP 2 CK and USMLE STEP 3 REVIEW COURSES. The only Adaptive as well as focused One-on-One USMLE Tutoring for USMLE Step 1, USMLE Step 2 CK, USMLE Step 2 CS, USMLE Step 3/NBME EXAMS/COMLEX/SHELF EXAM/MEDICAL SCHOOL SUBJECT EXAMS in Houston, TX (Now Available Globally via Skype). I took a Free session with Dr.Malik. I'm very happy with the result and I truly appreciate him, giving me two hours without any charge. In two hours, he made me understand my weak areas and the reason, I'm unable to pass my Medical boards. He has given me so many options and so many learning tools, that i'm Sincerely, very happy and I wish, I had contacted him earlier and not waited this long. I'm going to start my prep with him from next week and I'm very hopeful, that this time i'll make it and will finally have a passing score. I would highly recommend, his class to everyone. Thanks again Dr.Malik. Just had a free lesson with Dr Malik , he is a hardworkig and passionate teacher .He guided me with very useful tips about the exam . Recommend him to everyone. Thank you Dr Harish . Hello FM, I am glad that your USMLE Step 3 percent correct on uworld blocks went up by 20% after our USMLE tutoring Session! I worked with Dr. Malik for 2 months and he helped me pick up my weak areas and pass my boards. Having tried other methods for studying, I highly suggest working with him. He uses techniques that helped me learn the material so it builds a strong foundation for the future. 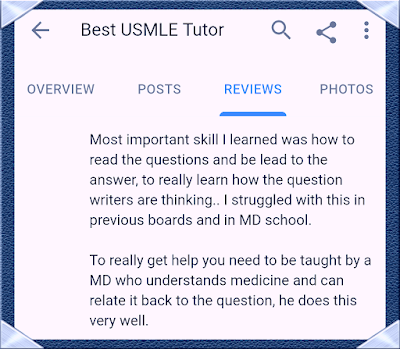 Hello Tom, thank you for using BEST USMLE TUTOR and leaving a student review about my one-on-one USMLE tutoring services and Good luck with your Residency training! The one to one approach, and very exam oriented approach and his peculier style of approaching Step 3 MCQs and CCS approach will help you pass your Step 3 just like it helped me. Hello Bella, thank you for choosing my USMLE Tutoring services and giving BEST USMLE TUTOR the opportunity to help you pass your USMLE Step 3. Congratulations! 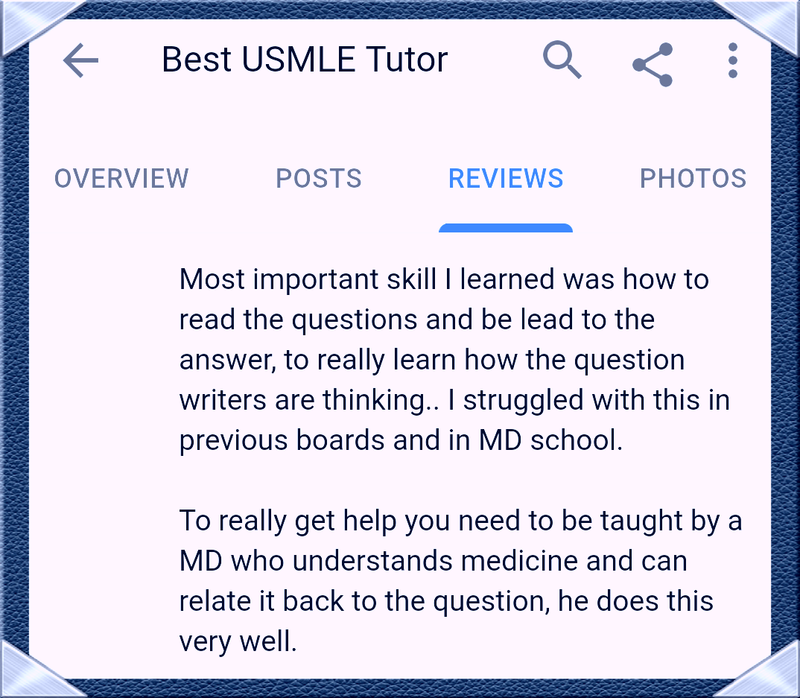 Thank you for leaving a positive student review and sharing your USMLE Step 3 Success Story with BEST USMLE TUTOR Students! Dr. Malik. my name is dr walid farkouh, i was pleased to know MALIK in person .my name is dr walid farkouh , i just passed USMLE step 3 with a score of 190. i took some free sessions with DR malik and honestly the man know what he is doing. first let me explain something , usmle step 3 is getting more and more hader every day . i took the exam in november 2012 and i failed by 189 and then i retook it again in in april 2013 and i can sure that the e xams got more difficult. I accidentally came across dr. malik’s website when I was studying to take the step 2 for the second time. I have severe test anxiety and it prevented me from taking the step 2. I wanted a coach, someone to teach me test taking strategies and not to memorize every detail. That is when I decided to just browse over my options of a tutor/coach for this exam. Dr. Malik was the right accident that happened at the right time. He was a blessing from God, I called him just to ask questions about the cost. I wasn’t planning on starting with him, but he convinced me to do a free session, so I took his offer. I chose to learn about EKG’s and I was extremely surprised at the amount of knowledge he shared with me in one hour. This man clearly knows everything about medicine!!!! He knows anything & everything. He follows the latest guidelines and will teach you the skills to learn everything you should know. He is kind, patient and became a friend because he really cared about my progress. He didn’t just skip something because I didn’t feel comfortable, he sat there and explained until I understood it thoroughly. He taught be biostats in 1.5 days and I will never forget it. He will walk you through every question and get you to think just like him. I was shocked at how easy he makes things appear. He has turned my life around.. he got me an incredible score and improved it by 45 points, it’s unbelievable. He has tactics and techniques that all physicians should know. He will tell you how to train your brain because he has the skills and resources to get you there. I promise, when you see all the resources he has to offer you will start realizing USMLE is really not that difficult. Everyone should know where the USMLE info is coming from and equips you for your future. He taught me where to get the information and how to interpret the information. He taught me to let my mind take the test, instead of me trying to control it. His guidance is what made it possible for me to stand again with pride. I’m thankful to have met someone who is so humble and caring. He deserves way more appreciations then what he gets!!! In the beginning he had told me that he can get me a high score and like others, I doubted him but I needed the help so I started studying with him. He saw something in me that I couldn’t even begin to see and he believed in me. He encouraged me in the times of needs and told me to keep moving forward. I followed his instructions very diligently and precisely. I did every single practice exam he asked me to do and soon I saw a trend… on the real exam, I could guess where the question is going 9/10 times so I never changed an answer and went with whatever choice my brain picked first, as instructed by dr. malik. I let my subconscious mind take the real exam without consciously controlling… Dr. Malik was absolutely correct about it and I got a score that’s unbelievable!!! For any student to do well he or she must have complete faith in his master and that was my motto! If I’m going to pay him, I’m going to trust him and he just held my hand until I came out of that test. Even when I took the practice NBME before the real exam, I was still doubting myself but he kept telling me just trust yourself… and consistently my score just kept increasing, even after having severe test anxiety. He trained me to think like him and I was able to finish all the questions on time with even some time to spare. He will train you, as long as you trust him. He has been nothing but a blessing and I can’t wait to start step 3 studying with him, which I plan to take in the next 2 months. It was money well spent because no Kaplan or any other review can offer what dr. malik can offer, I can guarantee this!!! Thank you Dr. Malik.. you are absolutely the best!!!!!!!!! A friend introduced Dr. Malik to me after I had failed Step 3. I was under time constraint to take up the exam as soon as possible. Dr. Malik helped me to prepare for the exam in ‘less than a month’. He was able to pinpoint my areas of weakness and helped me through them. The tutoring classes for me were basically MCQs, and clarification of the various concepts wherever I was wrong. He is very knowledgeable. He also makes a sincere effort to know his student. The classes were friendly, stress free and pleasant. He also motivated me to overcome my anxiety of the exam. He got me ready in just a few weeks. Oh yeah! I did get a good score. Thanks to Dr. Malik for his sincerity and loyalty toward his students. At first, I was skeptical about being able to pass Step 3, especially given that in psychiatry, we have very little exposure to internal medicine compared to other specialties. I was considering other review courses, however, I felt that in general, review courses for this exam go over commonly tested concepts without going through sample multiple choice questions and how the correct answers were obtained. I felt that USMLE World questions were helpful in preparing for the exam, but some of the explanations to their questions did not address specific questions that I had about a given clinical scenario. I liked the individualized tutoring sessions because the sessions were laid back, helped me focus on my specific areas of weakness, and addressed my specific questions. Dr. Malik is very professional and knowledgeable, and as others have stated, he does truly make a sincere effort to get to know his students. Also, he was willing to work with me to find a convenient time to schedule the tutoring sessions. During the exam, my computer froze and as a result, I was unable to complete the exam; however, I still obtained a solid passing score despite this! Thank you Dr. Malik for your dedication to your students! "Best USMLE Tutor" truly is an understatement. I am a student whom failed step 2 CK multiple times and I nearly gave up all hope. Then a friend of mine told me about Dr. Malik and how he helped him achieved a passing score on step 2. Honestly at first I was very skeptical, I just thought one this is probably some scam artist and my friend merely got lucky and would've passed on his own the next time around and two I'm probably beyond help anyway. Nonetheless, I figured it couldn't hurt to at least use his free first session. Let me tell you, that was by far the smartest and best decision I have ever made in my life. After that first call, I knew Dr. Malik was indeed legit. I mean he knows his stuff. He is well inform on current medical issues and he knows just how to teach and explain the material. He is thorough, honest, very professional and straight forward. Unfortunately due to my financial limitations I was only able to work with him very sporadically (5 sessions at most), but my scores went from a 175 to a 212...so you be the judge. But believe you me, if one is serious and truly wants to pass their exam, do yourself, your wallet, and your medical career a favor and give this man a call, TRUST ME!!!! Thank you very much Dr. Malik for all your help,I look forward to working with you soon on USMLE Step 3! In my desperation, I knew I had to do something different. I did some online research looking for a tutor. That was when I found Dr. Malik. At first, I was skeptical, as I didn't know anyone that had taken his course. However, he was prompt to alleviate all of my concerns and questions. He even provided a free introductory session to show me a preview. I decided to sign up. Within one month, I already KNEW I was on my way. Classes were great and supportive. Dr. Malik gave me all the tools that I needed and was lacking in order to pass Step 3. He even provided individual assessments of my weaknesses and strengths in order for me to progress. I actually had FUN in the process and had structure and a schedule counting down to exam day. Step 3 is a special exam, much different than the other USMLE exams and really needs more than what the other services provide. If I had to start over again, I would bypass the other material and courses and only use Dr. Malik. I HIGHLY recommend using his services for USMLE Step 3. Dr. Malik may seem a bit intimidating at first. But after a few sessions, you’ll realize just how insightful and helpful he is. My fiancé and I took a three-week course with him and met about every morning for a few hours prior to our exam. He guided our studying so that we covered high yield material and avoided miscellaneous information that students can easily get trapped in. He knew all testable material on various topics and learning from him really helped instill key concepts. Most of our tutoring was in the form of question review. We would go over questions we were stuck on, confused about or answered incorrectly. This was key in our score improvement. Both our scores increased by about 25-30 points in only three weeks. This is because Dr. Malik walked us through each question and taught us how to interpret each vignette. It helped to bridge the gap between the information we were learning in Frist Aid and Pathoma and the application of that information in test format. I highly recommend Dr. Malik because of his extensive knowledge of the exam, his simple explanations for complicated material, his vignette reviews and his ability to develop personalized study plans based on the individual’s strengths and weaknesses. He offers honest evaluations, critiques and advise and does not sugar coat his expectations for your exam performance, which was helpful in deciding our exam dates. Overall, I am really grateful for having him as a tutor. It would not have been possible to get that score without his help! Dr.Malik is an amazing tutor, his teaching style is uniquely structured. He is a very motivated, hardworkig and passionate teacher. He guided me with very useful tips about the exam to build my confidence. I would highly recommend, his class to everyone. it will improve your knowledge, confidence, and test-taking abilities. Thanks again Dr.Malik. Dr. Malik was very helpful in assisting me to pass the board exam after I had struggled with it, and my score improved significantly in a couple of months. He is very intelligent and knowledgeable. His clinical pearls and experience were very beneficial in helping me recall information during the test. His experience with tutoring is also vital to success with exams. His approach to taking the exam is different than a typical student’s approach to exams. Thus, it is important to take his methodology and feedback toward test-taking into account. He keeps up with students in order to monitor each student’s progress. He helped tutor during a limited time frame and prioritizes his students’ time. Due to his expertise and knowledge, I would definitely recommend Dr. Malik. I wasn’t completely thrilled with the idea of doing online tutoring and a full online course. I didn’t know what to expect. A friend of mine introduced me to Dr. Malik and after the first online meeting I knew taking his course was the right direction to get past my exam. I studied for 9 months the first time with CK and was unsuccessful. I knew I needed this help. After the first class and tutor session I was sure I made the right choice and to continue. Dr. Malik changed the way I viewed questions and medicine as a whole. He’s the reason I am able to apply for residency this year. He not only taught me medicine, but the background and foundation to medicine. He took his time and made sure I understood concepts. Thank you so much for everything Dr. Malik. I look forward to working with you on Step 3 and becoming another one of your success stories. I googled step 3 help and found Dr Malik website and I called him and he literally started to help me from day one I failed step 3 twice while in residency due to very less time to study. Dr Malik gave me the confidence and he pointed out my mistakes and built lot of confidence. He was able to pinpoint my areas of weakness and helped me through them. The classes for me were basically MCQs, and clarification of the various concepts wherever I was wrong. He is very knowledgeable. He also motivated me to overcome my anxiety of the exam. Thanks to Dr. Malik for his sincerity and loyalty. I would not pass this exam without his help. I would recommend his help. Dr. Malik was recommended to me by a friend after I needed help passing Step 3 while balancing the busy schedule of residency. His experiences with tutoring students with all types of stories and backgrounds help him understand where you are coming from. He utilizes the NBME practice materials as a main source of assessment and teaching. Dr. Malik's medical knowledge is outstanding and very well rounded. I felt that way from the first session I had with him. He does a great job of breaking things down, and has a really strong foundation of essential concepts in medicine, many of which are the things we learned many years ago and have trouble with. He is very familiar with USMLE questions, patterns, and what type of things they focus on and continue to expect us to know. He stays up to date on everything including screening guidelines which is very important for Step 3. For me, working with him helped me increase my Step 3 significantly after just 3 weeks. We went over a lot foundations of independent practice material because that's what I struggled with more. He is good at identifying and focusing on your weakness. He was supportive, dedicated, and driven to helping me succeed at a really difficult time when my back was against the wall and I needed help. I am thankful to him for giving me the push I needed to pass my test. I found out about Dr. Malik 1 week before my ck exam. I needed some guidance on tips and strategies as i was baffled about my NBME score vs my UWSA scores. He was very supportive and super helpful he even spoke to me on skype for 3 hours free of charge discussing how to approach questions, giving me thoughtful insight of the most basic concepts and doing some questions and listening to heart sounds audio. He even shared with me many valuable resources. I really wish i had known him 2 years ago when he used to run group studies hence cost and motivation. Dr. Malik is very kind and knowledgeable and i look forward to ask for few sessions for step 3. Being an IMG on a very tight budget is a minus for me, Dr. Malik is trustable and can save a lot of time and energy; If any one willing to form group study would be great. I was looking at several forums about STEP1, and I came across comments about Dr. Malik and his review program. Consequently messaged him via his website, and in less than 5 minutes, I received a reply. A few days later we spoke on the phone, and I have to say, it was a wonderful experience. Dr. Malik is genuinely a kind sole. He took his time to listen, and advice me without limiting our conversation. In addition, he remained in contact with me, while sending me links to various sites which he recommended to review. THANK YOU DR. MALIK for all your help. Dr Malik is The best medical teacher a student can have!!! He gave me a free 2 hr session and not only pointed out my mistakes but also taught me how to not do those mistakes again. Since it was a free session I wasn't expecting much but I was amazed by the amount of details he provided on how should I be studying and also gave me a lot of very useful free material. He has tremendous amount of knowledge and it's very generous of him to share that knowledge even in his free sessions. I absolutely recommend him to to any medical student. Thank you so much Dr Malik for all your help and support. To this point, I've only spent approximately 3 1/2 hours with Dr. Malik but am extremely committed to using his tutorial program to help me achieve successful completion of my USMLE steps. His kindness and generosity of his time has shown me I need to reintroduce myself to the very basics of medicine. I am currently studying numerous links he has provided, free of charge, helping me grasp the strongest of building blocks on which I may construct a concrete foundation of all of medicine. I eagerly await my continued studies with Dr. Malik and would strongly recommend Dr. Malik to all those attempting USMLE step examinations. I plan on providing continued updates on this forum to help those interested in this program understand it's value. As someone who needed more helpful when studying, I found Dr. Malik to be the right person for STEP. He gave me a good foundation before moving on to questions. Dr. Malik is super knowledgeable and knows why each answer is either incorrect or correct. Studying for these exams is not an overall easy process but at least with Dr. Malik, the journey is a tad bit smoother! Dr. Malik is very knowledgeable, and explains concepts very well. He is so willing to help and helps me grasp concepts easily and fast. He has a way of explaining basic concept that is unique and unforgettable. He is worth the time. I was looking for a tutor to help me ace the step 2 ck and found Dr. Malik's website. The free 2 hour session was very helpful and resourceful. Dr Malik takes you back to the very basics which is very important to understanding the questions being asked in the boards. I Found him very knowledgeable and dedicated to what he does. Thank you Dr. Malik for all your support! I was desperate, literally. I had failed to pass my USMLE Step 3 exam on multiple trials, lost my job, even after completing my residency in psychiatry and child psychiatry fellowship. I didn't know what to do, but I am Buddhist and firm believer that things happen for a reason and people are brought into our lives for a reason. I did a google search for tutors, as I felt that it was my only option I had left. I had nothing to lose at this point, so I called him. Dr.Malik, I think after hearing my story was skeptical as well if I could pass this exam, as the odds were against me. However, after we talked for a bit, I think he heard in my voice, my determination not to give up. So he invested his time in me and I invested my life in learning from him. It was not an easy road, it was a challenge being so far removed from general medicine for so long but that's what makes us passionate about medicine. Dr.Malik not only helped me with knowledge portion of the exam, I think the biggest challenge to passing the exam was my own fear and anxiety about "what if". He truly helped me work through my fears. We had completed all of the questions and lessons and I just had to sit down meditate and let all my worries go and just do what my mind told me to do. I took the exam and for the first time, I sat there not a nervous nelly, but very calm and centered, knowing that I did all I could do and that I have a lot of people who believe in me and support me. And as I waited for months for the results, they finally came in with a PASS!!! I conquered the odds, and I have Dr.Malik to thank for believing in me, for helping me remember what my passion is and how all the hard work is worth it in in the end. He came into my life for a very good reason, and has taught me countless lessons not only about medicine but about life. Thank you, Dr.Malik!! I finished my psychiatry residency in July 2017 but was not able to pass the step 3. I felt so humiliated in front of my classmates while they were taking about their new jobs. I was traumatized, emotionally disturbed that started affecting my family happiness. When we go out for dinner we didn’t enjoy it, Always felt a burden. I tried myself so hard to pass this exam. I even sent my 4 years son back to my country hoping that I will be able to focus and will be done with my exam. I enrolled Kaplan course. But none of it worked. I had three attempt and my score was trending down with each attempt despite putting whole hearted effort. I was alarmed when my score in third attempt was 167. I never had such horrible score in my life. Then I realized that I needed some help. I googled and found Dr. Malik website. I spoke with Dr. Malik. After speaking to Dr. Malik I realized that I was not preparing the right material. I was just putting my effort. He is indeed a great tutor. He genuinely wants to help people like us. He is extremely knowledgeable and explains thing in a simple way. He teaches how to approach the question. When I went for the exam. First time in my life I enjoyed the exam. I got my result on August 9th and I passed and got 203. It was huge improvement from 167 to 203 and all the credit goes to him. I do strongly believe that god comes in a form of a person. For me he is the god who helped me in the worst phase of my life. For 4 years I never saw a light in the tunnel and Dr. Malik not only helped me to see the light but to cross the tunnel. I honestly don’t have words to thank him for all the support educationally and emotionally. The money that I spent is nothing compared to the relief that I have in my life now. And the credit goes entirely to Dr. Malik, thank you. Please free to contact me should you have further questions. After multiple attempts at Step 3, and brink of non-renewal of contract, I decided it was time to get some help (as re-reading MTB, first aid, re doing qbank questions was not helping). I came across many tutoring services for step 3, and even had sessions before choosing the right tutor. I chose Dr. Malik based on the following: live one on one course with extensive and thorough feedback. He has a methodical approach to understanding basic science concepts and correlation , understanding and identifying weak areas and how to calmly and effectively pass the exam. Don't get me wrong, you have to do the homework and study on your own, in order for this to be fruitful but his is teaching style is different than other tutoring services. During the time I was with him, I had my moments of being a weak link but he was there to provide moral support and reiterate the end goal (which is to pass the USMLE). His moral support was an uplifting factor and helped me to gain confidence day by day. Up until the exam date, he was supporting me and making sure I stayed focused to pass the exam. He not only helps to drill concepts into your head but he also takes the time to explain the details that we often overlook (and those are usually tested!!). The time, effort and money is well spent! If anyone is in the same boat as me, then contact Dr. Malik asap. I took my step 3 and finally passed this time with flying colors (scored 30 points above my nbme exam) and I highly recommend his services. Thank you, Dr. Malik. I found his web site online and hesitantly called but I didn't leave a message. He called me back right away and as soon as I started my conversation with him, I realized and felt his care and seriousness about his teaching and guidance and the best simple steps to leads us to pass USMLE successfully with confidence and better knowledge، After only one FREE session with him I feel really motivated and found the easiest way to study for success. I really recommend Dr. Malik to all of the students and medical graduates, who are trying to ace USMLE in first attempt. I worked with Dr Harish Malik for some time for step 1 & I felt that his method really makes things stick. 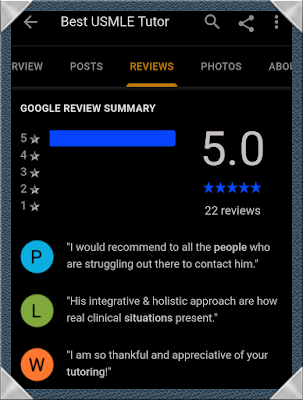 His integrative & holistic approach are how real clinical situations present. His way of analyzing vignettes is genius! After a few sessions your perspective on how you read questions will change. Essentially this is what the steps are looking. Definitely recommend Dr. Malik vs. paying thousands on a board course which don't teach you test taking. That's 1/2 the test! I will totally recommend Dr Malik. This was my last opportunity to take the step 2 CK test. Though I had to deal with a lot of anxiety and I did not get to complete all the required material with him, the time he and I spent was sufficient enough to take me over and pass with a 220 for the step 2 CK . It was like for the first five blocks of the exam I saw questions that he and I discussed. For the first time ever I was smiling quite a bit while taking an exam. And just that familiarity with the information helped keep the anxiety at low tempo.He has an interesting sense of humor which actually helped me remember certain details. His approach to tackling individual questions is also superb. It completely revolutionized my perspective and approach to question cases which I now did with more confidence. I was also getting more questions right . From hence forth any board exam I will take, I will definitely work with him for it. I will take the step 3 next year and absolutely will not take any chances. I truly believe working with him will help me get an even better score than just passing.Even if you complete half the material with him and study hard, you are very likely to pass..
Just had a free session with Dr.malik. he is really amazing. Hats off to the effort he put to make people understand the concept. He made me understand where i stand in the field of medicine. Understood my weakness. I'm sure he will make the person pass whoever joins him. Thank you so much sir for spending ur valuable time in making me understand the concepts. I wanted to have a high score on the step 2 CK and contacted many tutors to find someone who would be the best fit. Dr. Malik was very unique in terms of his approach to medicine and students and his style of teaching. Most tutors just drill you and have you memorize lots of information – that’s fine and necessary in some cases – but his style achieves even more. Dr. Malik teaches by identifying overarching concepts and making useful connections and analogies from real life examples. He helps you make connections between different organ systems and physiologic processes and basic science (i.e. like gravity, elasticity, etc.) that can be applied across all situations. This applies to not just to USMLE questions, but to the practice of medicine generally. This really helped me to have to memorize much less, understand a great deal more, and actually enjoy studying medicine again. All tutors know a lot of facts, but Dr. Malik is uniquely able to help students make overarching themes and apply principles universally. Within just a couple sessions I started looking at these concepts in a whole new way, and I began to realize how obvious the answers could be if I just interpreted questions the way he does and applied the correct principles. As I am not a great memorizer, this was really important for me and was the MAIN reason I chose Dr. Malik over other tutors. After just the free intro session, questions were immediately easier to approach and answer! Then in just a few weeks, I improved 30+ points on NBME practice tests! Additionally, Dr. Malik actually ENJOYS doing this stuff and is really is passionate about helping his students CONQUER these exams, too! He genuinely gets a kick out of doing these questions, interpreting them with students, and talking through how to approach the topics! And this is the bulk of the work with him. For me this was very motivating, and his humorous and positive approach also helped me to remember everything I learned with him as I began to apply the concepts to questions and practice tests. Dr. Malik is also just a good, positive person and very professional – it was a pleasure to be his student. He is easily reachable to his students and is flexible with setting up sessions. He accommodated me every time I needed to change a session or meet with him earlier or later than usual. Lastly, Dr. Malik is very straight forward and honest; he doesn’t guarantee you’ll pass your exam just by signing up. You have to actually do the work and follow his direction to get the scores you want. He KNOWS what it takes to beat these exams and is STRATEGIC about how to get there! His moniker of “bestusmletutor” is very fitting, and after investigating so many other programs, I can say it is absolutely true! I highly encourage anyone who wants to ace USMLE step 1, step 2CK/CS, or step 3 come to Dr. Malik! Thank you so much for all of your help Dr. Malik! I took a Free session with Dr.Malik. I'm truly so impressed with the information he provided in such a short time. I learned so much from him in just under a few hours. I have booked hours to work with him towards my USMLE exam and I can’t wait to get started. I know with Dr. Malik help I will do well on my Step 1 exam. I can’t wait to get started with the tutoring sessions.Thanks again Dr.Malik. I had a chance to speak with Dr Malik and took a brief session. It was really an eye opener with the tactics to conquer the steps. I learnt very simple ways of thought process to tackle the concept in just over an hour. Looking forward to have more sincere tutors like Dr Malik to guide us the right way. Thank you once again sir,for your valueable time and effort to over see our weakness and shortcomings in the right manner along with your honesty and determination. Yesterday I was looking at Step 1 forums on FB and I came across Dr. Malik's webpage of bestusmletutor.com. I left him a message and he called me back promptly on the same day. He very kindly offered to give me a free session, and after talking to him over the phone, I saw that he was a wonderful person with extensive knowledge and experience. He is a very good teacher and motivator. I must say that a good teacher should have qualities that keeps a student's motivation strong, and Dr. Malik definitely has those qualities. He advised me with lots of tips, and not only that, but he also sent me helpful links for various sites to review. It's very generous of him to share that knowledge even in his free sessions. His concepts are very clean, and that helps students to solve MCQs with higher scores. I must highly recommend him to those who really want to achieve great scores and pass their step 1 in their first attempt. I worked with Dr. Malik for only 5 hours, and my score went up by 40 points on CK. I think that says it all about Dr. Malik’s teaching. He is simply amazing Tutor who uses different tactics to approach a question and makes it so easy to answer. His free trial of Tutoring is definitely worth trying! I am very pleased with my results. I’m a wife, a mom and a student and I worked very hard. I’m so glad I had Dr. Malik to help me get through this. I definitely recommend Dr. Malik for your future exams. Thank you so much Dr. Malik! God bless! I want to share my experience with Dr. Malik. I took classes with him after failing twice Step 3 exam and after having done twice U world and MTB.. He was able to detect my weak areas very soon and explained me the concepts that I couldn't grab by my own. He gave me extra material and other resources to read and home work to do as well. He never guaranteed me that I was going to pass but helped me to feel more confident and gave me enough margin with my knowledge to pass. Definitively he is a good teacher, enjoys his work and he only cares about teaching good medicine and giving the best care to patients. I don't want to finish my review without mentioning that I finished medical school more than 20 years ago and I wished I have met Dr. Malik before to avoid the traumatic experience of failing twice Step 3 exam. Definitively don’t hesitate to hire him. Dr. Malik went above and beyond to ensure I succeeded in Step 2 CK! Before I started working with Dr. Malik, I was consistently failing every practice test. He was able to patiently and clearly explain concepts I had trouble understanding. Since I do not memorize well, Dr. Malik worked to foster a deep, integrated understanding of the material . We also focused on studying the structure of test questions to better answer them. Dr. Malik would also accommodate my schedule to allow for a better work-life balance during my study period. Dr. Malik expects much from his students. He would regularly send me additional resources to review on top of recommended practice questions! But his methods gave great results. Not only did I see a 40 point gain in my Step 2 practice tests, but I was able to more confidently answer questions in the hospital setting. I could not have achieved this without Dr. Malik's guidance. I worked with Dr. Malik after two failed attempts with Step 3 exam. I consider Dr. Malik an excellent tutor that gives each student the time they need to consolidate the knowledge. I finished medical school almost 20 years ago and had to begin bio and immunology from scratch. I was able to do it because of him. Dr. Malik was able to make me enjoy the learning and and helped me to build my confidence to pass. I don't want to forget to mention that more than once I felt anxious regarding the exam and he was able to handle my anxiety in order to stay focus and continue studying. I would not hesitate to recommend Dr. Malik to everyone that want to ace the exam. Originally one of my biggest concern when taking standardize exam was the time. I always find myself running out of time when taking these exam. Dr. Malik was able to provide me with many test-taking strategies that helps me to beat the clock. After just 2 weeks of tutoring sessions with him, I went from not enough time to finish the exam to having 3 minutes extra! My percentile also increased for more than 20 percentile!! I especially appreciate Dr. Malik's teaching method because he uses real-world analogies to help me remember different pathophysicological disease processes. Because of the way he explains things, I am able to answer more questions intuitively with my "reflex" instead of wasting time and arguing with myself to pick the correct answer. This was a huge part of how I was able to cut down on my time and increase my accuracy when answering this questions. I plan to continue my tutoring sessions with him prior to my step 2 and I will definitely leave another update review after that! Hi everyone, I will highly recommend Dr Malik for USMLE preparation. I found him on google and just called for enquiries and he started lecturing me on fat embolism. Really helpful and friendly to work with. I just have my free session with Dr Malik , and he is amazing teacher, He encourage you to do your best , and see everything different, that we all can pass the USMLE steps, if we want and we have to see it and we have to work hard, but easily with a good strategy . I love How he work . I recommend Dr Malik for USMLE preparation to anyone . Thank you Dr Malik for what are you doing. I just completed my step 3 after over a decade away from medicine. I am a USA MD Grad (2006) that sold a startup that I created during Medical School and required me to be away from medicine. Dr. M helped me pass step 3 with a 216 on my first attempt. I had multiple attempts on step 1 and 2 yrs ago. My biggest issue was seeing how and where the questions were leading me. This is a skill not taught in school. You can know your DDx very well and still miss the question. He taught me how to see the patterns. I studied for 8 months, I used FA2 and FA3 UW2 and UW3 along with all of the essential NBME practice questions. In addition I did the MTB 2 and 3 videos and books to take a break from core learning in FA, somethings were better in MTB. Also free online stuff like Medbullets and online meded for specific topics. I even did one round of MKSAP questions to help speed up my reading time and confidence. 2 months of self reading meeting with Dr M weekly and then daily for 3 mo and then more self study with updates with Dr M.
I felt I needed to really spend more time reprogramming my memory since it had been over 10yrs. I did the Q-banks multiple times not focusing on memorizing the answer but the material and the logic of the question writers. In the end I ended up with a Std deviation of the mean so I guess its ok.. If Dr M could get me ready and I have been out of medicine for 10 years, most people should have no problem. Its expensive and Painful but his method works. I will recommend him to anyone, and will likely be back for the boards in the future. My cousin referred Dr. Malik to me after I had gone through my school's standard 4 weeks of dedicated study with an NBME score of 180 to show for my studying. I had spoken with a few other tutors before Dr. Malik was recommended but once I did the first 2 hours with him I knew he was someone I could trust. He assessed where I was at in terms of educational base, ability to read questions, ability to understand basic medical words and concepts; ultimately he identifies your gaps based on his extensive knowledge of the NBMEs and of his clinical knowledge. His teaching style is unique to say the least. His virtual rotation program (Step 2 shelf exam prep) which took me a little over a week improved my score by 20 points on my first practice step 1 NBME. That's without studying any Step 1 material--no first aid, no firecracker, no step 1 at all for those 10 days. After that we did first aid and uworld. My score steadily improved around 15 points with each NBME and the last NBME predicted my score within 1 point. I scored higher than my school's average and I achieved the goal I had set at the beginning of my studying. Since starting my rotations, my work with him has transformed the way I study. I am much more methodical and effective--he taught me how to study "smart" and the virtual rotations have accelerated my medical school education--I would be completely lost if I hadn't worked with Dr. Malik prior to my rotations. Dr. Malik is ALL IN for his students. His clinical knowledge and knowledge of the NBMEs is up to date and his way of explaining concepts is accessible and clear. His uncanny ability to adapt to the student he's working with pushes him to above and beyond status. I cannot say enough about Dr. Malik. "Best USMLE tutor" is practically an understatement. He prepared me for questions. taught me fundamentals, has a method of increasing test-taking stamina, and pushes you harder than you think you can go. This review is more a thank you to Dr. Malik. Those that study with him know they're working with one of the best. Get out of your own way, hire him, and try to keep up. It pays off. Thanks Dr. Malik. I'll see you for Step 2. After seeing a huge improvement on my shelf exam, I continued my tutoring sessions with Dr. Malik for another 2 months. I just received my USMLE Step 2 CK score today and it was an UNBELIEVABLE score! I am SO HAPPY and THANKFUL for getting an opportunity to learn Medicine from Dr. Malik. His teaching style is unique and may appear radical or tough in the beginning, but believe me, if you just trust in his process and follow through, you will do well on your exam! 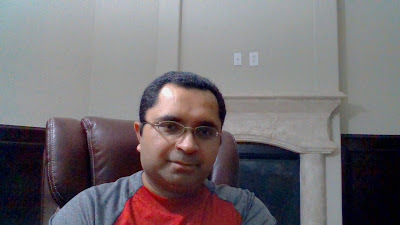 Dr. Malik helped me study for my USMLE step 2 exam. I was originally getting around 230, and in 2 months I took my exam and ended up with a 257! That was 10 points higher than any of the practice exams that I had taken during that time! Dr. Malik was wonderful to work with, and he was always available around the clock for tutoring sessions and any questions I had. Not only is he a great teacher to shows you how to look and really read what the question is telling you, but he is also a great motivator. He truly put his heart and soul into helping me, and for that I am forever grateful. Dr. Malik is a great teacher and I could not have passed the USMLE Step 3 without him. When I started working with Dr. Malik, I was very busy with my fellowship and was unsuccessful in preparing for the exam. During the first few sessions, Dr. Malik assessed my strengths and weaknesses and provided a study plan and schedule specifically targeted to address my weaknesses and to pass this exam. He patiently explained all of the concepts that I found difficult by providing focused and practical examples that would be relevant to the exam. Throughout the process, he was also very reassuring and encouraging, and kept a very positive attitude even when I was going through self-doubt and stress. He also followed up several times a week between our session to see if I needed help and to make sure I was sticking with our study plan. Throughout the three months I worked with Dr. Malik, I continued to see a significant improvement in MCQs, and practice exams. At the end of the three months, I was able to take the exam and pass it without any issues. Though Dr. Malik's teaching style may seem a little unconventional at first, my experience is a perfect example that his study techniques as well as his teaching method are highly effective. I would definitely recommend Dr. Malik whether this is your first time taking the exam or if you have failed in the past and need some help. i will say few words this teacher is an angel ,he has insight of students , and he can help people how to improve their scores , he basically hones people up to the mark, dr malik is a big recommendation from me. he helped me in ck step2. Thank you kindly for recommending BEST USMLE TUTOR'S services to those preparing for their USMLE Steps! I am glad I was able to help pinpoint what you needed to move your score up for your Step 2CK. Thankfully, Dr Malik. Thanks Dr Malik for the insight you showed me in preparation for step1 usmle, it has greatly helped me in seeing things the way I should.If you having difficulty with any of the usmle steps i definitly recommend Dr Malik. Dr Malik woke up early and offered 2 free hours of his time to help guide me with Step 3 last month. His insight, and study links with recent US guidelines, murmur review and more helped boost my score to passing on first try. The exam requires practice, doing well on CCS portion will give you the extra points if your borderline in scoring. Practice all Uworld cases… Archer 3 videos review excellent add on to FSMB 6 cases… Thanks Dr Malik for your time, If you have time to prepare, I definitely recommend Dr Malik as tutor! Best of luck! I met Dr. Malik for the first time prior to taking my Emergency Medicine (EM) shelf-exam. I had just received the terrible report, “you have failed STEP 2 CK” and now I was about to take another standardized test with little self-assurance of my results being any different from STEP. My already low confidence in any test taking abilities I thought I had plummeted to nearly nothing. Leading up to this point, for my first attempt, I tried what most medical students do in preparation for USMLE STEP 2 CK. I drilled hard through U-WORLD, read multiple prep books, watched hours of Online Med Ed videos and sought out advice from advisors and students from the grades above. After over a month’s worth of studying, my final score came to a 207. I felt like I had exhausted every resource available, so when my Mom approached me about Dr. Malik, whom she found online, I was honestly skeptical about whether or not he could truly help me. I decide to give him a chance. The night before my EM exam, I met him for the first time over skype. Before even getting into details about my study strategies, he could immediately point out my strengths and weakness just based on my past STEP scores. The areas he identified were things I would have never been able to point out in myself. Things like vocabulary, pictures and sounds which seem so simple but are actually so critical to mastering this exam. That night, Dr. Malik spent over 6 hours with me reviewing questions and core topics on the material for FREE. I scored higher on that exam after working with him, than I did on any other shelf exam studying alone. After seeing the results, I made the decision to work with Dr. Malik in my second attempt at studying for USMLE STEP 2 CK. From the very beginning, he was very clear about what would be required of me to improve my score from where I was at. Although there was much I needed to work on, I never felt alone through this process with him. He was not just a tutor to me, but also a mentor, a coach and an encourager. There were times when I felt so discouraged studying for this test a second time and wanted to give up, but Dr. Malik reminded me that I could really do this and he was right. I think one of the best parts about working with him is that he helps you see each question through a new set of eyes. The things I never paid attention to or that I would quickly zoom over, he stopped me at or would help me to slow down so I could see just how critical that piece of information was to the overall scenario and in turn, the diagnoses and treatment, etc. Dr. Malik has a way of making each question come to life so that they’re no longer just words on a page but an actual story and an exciting one. In the end, Dr. Malik helped me raise my score by nearly 30 points. I went from a 207 to a 235 and it still feels so good. It has given me so much confidence to go into residency interviews and be able to stand on that score. I can honestly say though, I don’t believe I would have achieved that without him. If you are finding yourself in a similar position that I was in, I would first start by saying, don’t lose hope! You can do this. But second, when you try again, consider not doing this alone. They say insanity is trying the same thing over again and expecting different results. I can tell you, Dr. Malik will not be like any other tutor you’ve worked with or any strategy you’ve attempted on your own. He is worth the money it costs to overcome your failure. My failure, was probably one of the greatest blessings in disguise. I’ve not only gained a new insight into how to approach these tests that I will take with me into my career forever, but also a new sense of confidence in my test taking abilities that I now know I’m capable of achieving. For all of this and more, I give thanks to Dr. Malik…For imparting his knowledge onto his students, caring for each of them so personally and above all, believing that with a little help, anyone can reach their highest potential, including me. Thank you for everything Dr. Malik! I am eternally grateful for you! Dr. Malik has been nothing but super helpful. He came in when I had been trying to study for USMLE 3 and had been making no progress. My confidence was down and I was starting to lose faith in myself. Dr. Malik stayed with me as long as it took to pass the Step 3, not only that he reminded me to keep a positive attitude and never gave up on me. He was extremely helpful and I am grateful. Thank you Dr. Malik!